Certainly is the only way to get replies, lately! Sheesh. I have been a member for one day. Is this the reason for the (.) after my name? It is a secret tracking device that we stick on all newbies. Now that you have found us out you will be hunted down. It is nothing personal you understand. Do you have any last messages you would like to send to your family or friends? Laz I must say, judging from your most recent picture, that Adkins diet has done you a world of good! You'll get the hang of paragraph breaks after awhile. Good post. "Another article I read a few years back had an accompanying photo of the encrusted device. Was there a photo with this one?" Yup. I've seen a picture of the original and also a present day replica of the original. Sometimes I find myself saying ridiculously outrageous things just to see if people are actually paying attention, or if they are 'Sparrow Posting' (Fire and Forget). 'Sparrow Posting' (Fire and Forget). ...That's funny and I actually "get it" I don't usually. ...Maybe we should be thankful that there's no "Sea Gull Posting"
the important question is, did the greeks play quake1 ctf on the computer? Why not the computer? They did already have the pipe organ, even though it was invented earlier in Egypt. There was lots of technology around. ...we do know who was generally recognized as the inventor of such an instrument, the first pipe organ. His name was Ktesibius and he lived in Alexandria (in what is now Egypt) in the third century BC. The son of a local barber, he was an engineer specializing in hydraulic and pneumatic devices. Which sort of leads to the question, "Did Jesus play the pipe organ at his services?" "Amazing how how much nicer we are to a young female with a pretty name..."
I didn't check...I was searching for supporting data. At the western entrance to the Aegean Sea, midway between the islands of Crete and Kythera, rises little Antikythera. It was off that island in 1900 that a sponge diver found, on the bottom, the wreck of an ancient ship loaded with statues, amphorae and other objects. This wreck was the first great under water find of modern archaeology. It yielded not only a rich hoard of art treasures but an astonishingly sophisticated scientific instrument. But while the marble and bronze statues and the pottery were recognized at once as the work of Greek artisans around the time of Christ, the bronze instrument, encrusted with calcareous deposits lay ignored. As it gradually dried, the ancient wood casing and internal parts cracked and split into four flat fragments, the inner sides of which revealed parts of geared wheels together with some barely legible inscriptions. Thereafter, as cleaning exposed more gears and inscriptions, scholars affirmed that the device was a navagational tool, an astrolabe, used to determine the altitude of the sun and other celestial bodies. This identification was remarkable enough, considering that only simple implements had previously turned up from the Hellenistic period: yet even so it was, more and more obviously inadequate for so complex assembly. What, then, could it be, this mysterious Antikythera mechanism? In 1951, an American historian of science, Professor Derek de Solla Price of Yale, became intrigued by the riddle. While other scholars established that the wrecked ship, almost certainly bound for Italy with wares from Asia Minor and the Greek islands, had floundered in about 78 B.C., Price studied the device himself. At last, in 1959, he announced in print that the mechanism was, as he called it in his article, "An Ancient Greek Computer"; one that indicated by means of dials and pointers, the motions of the sun and moon past, present and future and synchronously, the moon's phases. A computer- in the first century B.C.? The claim excited much skepticism and one retired professor insisted that the device had to be a modern orrery- of the kind he had seen as a child used to demonstrate the Copernican system- which had somehow intruded on the wreck. (He was, in fact, not far off on it's function but totally off on its date.) Certain popular writers, by contrast, eagerly accepted the identification of the device as a computer- but asserted it could only have been made by extraterrestrials from a technologically superior civilization. Unfazed by any of this, Price continued to puzzle out the numerous small but critical problems the mechanism presented, attemting to complete computing the number of teeth on the gear wheels (none more than partially visible) and determining as best he could, which gears meshed with which others. The work went slowly until 1971, when learning that gamma-radiography could see through solid matter, Price persuaded the Greek authorities to let his collaborator, Dr. Karakalos take gammaradiographs of the fragments. These revealed so much detail, so clearly, that after analyzing them the two men could confidently relate the gear ratios to known astronomical and calendrical data and in 1974, Price submitted his definitive findings to the American Philosophical Society. Activated by hand, the Antikythera mechanism consists of a train of more than thirty gears of greatly varied sizes meshing in parallel planes but its most spectacular feature is a differential gear permitting two shafts to rotate at different speeds, like the one that allows the rear wheels of a modern car to turn at different rates on a curve. There is no mention of the Antikythera device in ancient literature but a similar mechanism was described by Cicero and later by Ovid and others: this was an ingenious planetarium, simulating the movements of the sun, the moon and the five planets, that had been devised in the third century B.C. by Archimedes. Cicero, incidentally, was on Rhodes between 79 and 77 B.C., just as the Antikythera mechanism was presumably lost at sea; while there he saw a geared planetarium that may have been built by Posidonios, a renowned geographer (among other things) who lectured in Rhodes. The Antikythera device derives then, from Archimedes, either by a gradual, unrecorded evolution or by the massive innovation of some unknown genius, perhaps of the school of Posidonios. If only for his use of the differential gear, "one of the greatest basic mechanical inventions of all time," its maker should, says Price, "be accorded the highest honors." ...You must not have seen my reply to a post last night.I caught "heck" a little bit but it was expected and I took it in stride I think. ...I'll take this time to say a big THANKS to everyone for being so nice to me. WHEN a Greek sponge diver called Elias Stadiatos discovered the wreck of a cargo ship off the tiny island of Antikythera in 1900, it was the statues lying on the seabed that made the greatest impression on him. He returned to the surface, removed his helmet, and gabbled that he had found a heap of dead, naked women. The ship's cargo of luxury goods also included jewellery, pottery, fine furniture, wine and bronzes dating back to the first century BC. 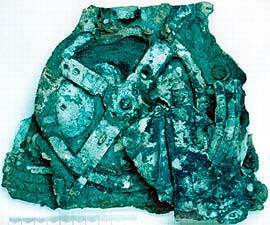 But the most important finds proved to be a few green, corroded lumpsthe last remnants of an elaborate mechanical device. Michael Wright, the curator of mechanical engineering at the Science Museum in London, has based his new analysis on detailed X-rays of the mechanism using a technique called linear tomography. This involves moving an X-ray source, the film and the object being investigated relative to one another, so that only features in a particular plane come into focus. Analysis of the resulting images, carried out in conjunction with Allan Bromley, a computer scientist at Sydney University, found the exact position of each gear, and suggested that Price was wrong in several respects. In some cases, says Mr Wright, Price seems to have massaged the number of teeth on particular gears (most of which are, admittedly, incomplete) in order to arrive at significant astronomical ratios. Price's account also, he says, displays internal contradictions, selective use of evidence and unwarranted speculation. In particular, it postulates an elaborate reversal mechanism to get some gears to turn in the right direction. Since so little of the mechanism survives, some guesswork is unavoidable. But Mr Wright noticed a fixed boss at the centre of the mechanism's main wheel. To his instrument-maker's eye, this was suggestive of a fixed central gear around which other moving gears could rotate. This does away with the need for Price's reversal mechanism and leads to the idea that the device was specifically designed to model a particular form of epicyclic motion. A device that just modelled the motions of the sun, moon, Mercury and Venus does not make much sense. But if an upper layer of mechanism had been built, and lost, these extra gears could have modelled the motions of the three other planets known at the timeMars, Jupiter and Saturn. In other words, the device may have been able to predict the positions of the known celestial bodies for any given date with a respectable degree of accuracy, using bronze pointers on a circular dial with the constellations of the zodiac running round its edge. Mr Wright devised a putative model in which the mechanisms for each celestial body stack up like layers in a sandwich, and started building it in his workshop. The completed reconstruction, details of which appeared in an article in the Horological Journal in May, went on display this week at Technopolis, a museum in Athens. By winding a knob on the side, celestial bodies can be made to advance and retreat so that their positions on any chosen date can be determined. Mr Wright says his device could have been built using ancient tools because the ancient Greeks had saws whose teeth were cut using v-shaped filesa task that is similar to the cutting of teeth on a gear wheel. He has even made several examples by hand. How closely this reconstruction matches up to the original will never be known. The purpose of two dials on the back of the device is still unclear, although one may indicate the year. Nor is the device's purpose obvious: it may have been an astrological computer, used to speed up the casting of horoscopes, though it might just as easily have been a luxury plaything. But Mr Wright is convinced that his epicyclic interpretation is correct, and that the original device modelled the entire known solar system. That tallies with ancient sources that refer to such devices. Cicero, writing in the first century BC, mentions an instrument recently constructed by our friend Poseidonius, which at each revolution reproduces the same motions of the sun, the moon and the five planets. Archimedes is also said to have made a small planetarium, and two such devices were said to have been rescued from Syracuse when it fell in 212BC. This reconstruction suggests such references can now be taken literally. It also provides strong support for Price's theory. He believed that the mechanism was strongly suggestive of an ancient Greek tradition of complex mechanical technology which, transmitted via the Arab world, formed the basis of European clockmaking techniques. This fits with another, smaller device that was acquired in 1983 by the Science Museum, which models the motions of the sun and moon. Dating from the sixth century AD, it provides a previously missing link between the Antikythera mechanism and later Islamic calendar computers, such as the 13th century example at the Museum of the History of Science in Oxford. That device, in turn, uses techniques described in a manuscript written by al-Biruni, an Arab astronomer, around 1000AD. The origins of much modern technology, from railway engines to robots, can be traced back to the elaborate mechanical toys, or automata, that flourished in the 18th century. Those toys, in turn, grew out of the craft of clockmaking. And that craft, like so many other aspects of the modern world, seems to have roots that can be traced right back to ancient Greece.